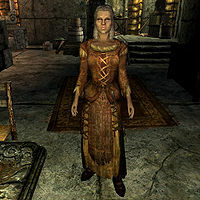 Nana Ildene is a Breton witchblade who works and lives in Markarth at The Treasury House. She works as a cleaner and has done so for twenty years. Her true colors are revealed during The Forsworn Conspiracy. Nana Ildene spends all of her time sweeping the floor at the foot of the southwestern stairs, just behind the chair where Betrid Silver-Blood sits with her book. During the related quest, should you choose to question Thonar Silver-Blood, Nana Ildene will immediately attack Betrid, who will suffer a scripted death. You will then have to fight her, with the inevitable result. If Nana survives the quest (see notes) she will sweep the floor indefinitely. She wears a set of farm clothes and a pair of boots, and is equipped with a steel dagger. She carries a key to the Treasury House and a selection of lower-class loot and gold. She knows several spells, specifically Oakflesh, Raise Zombie, Fireball, Firebolt, and Steadfast Ward. Nana Ildene will greet you with: "You just let old nana know if you need anything, all right dear? ", and will proceed to tell you: "I've worked in the Treasury House for almost twenty years." and "There isn't an inch of this building that I haven't cleaned up." Thonar: "Ah, Nana Ildene, whatever would my family do without you?" Ildene: "Ah, Thonar, don't you worry. Nana Ildene isn't going anywhere." Thonar: "Um, good. We reward loyalty, you know." Ildene: "Oh, I know, Thonar. Only a mad woman would ever betray the Silver-Blood family." Rhiada: "You have worked here in the Treasury House for a long time, haven't you Ildene?" Ildene: "Yes, child. Nana Ildene has taken care of the Silver-Bloods for many years...."
Rhiada: "It's just... aren't you worried about the Forsworn? Maybe it's not safe here." Ildene: "Don't you worry Rhiada. If any Forsworn coming knocking on our door, Nana will let you know...."
Rhiada: "Thanks Nana. I feel better now." Ildene's death (and her attack on Betrid) can be avoided by pickpocketing and reading Thonar's or Nepos's journals instead of questioning them. Alternatively, it can be avoided by going directly to Eltrys after questioning Nepos the Nose. This page was last modified on 20 March 2014, at 16:22.